A computerized axial tomography scan is an x-ray procedure that combines many x-ray images with the aid of a computer to generate cross-sectional views and, if needed, three-dimensional images of the internal organs and structures of the body. Computerized axial tomography is more commonly known by its abbreviated names, CT scan or CAT scan. A CT scan is used to define normal and abnormal structures in the body and/or assist in procedures by helping to accurately guide the placement of instruments or treatments. A large donut-shaped x-ray machine takes x-ray images at many different angles around the body. These images are processed by a computer to produce cross-sectional pictures of the body. In each of these pictures the body is seen as an x-ray "slice" of the body, which is recorded on a film. This recorded image is called a tomogram. "Computerized Axial Tomography" refers to the recorded tomogram "sections" at different levels of the body. Imagine the body as a loaf of bread and you are looking at one end of the loaf. As you remove each slice of bread, you can see the entire surface of that slice from the crust to the center. 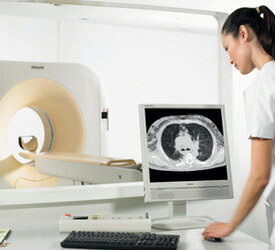 The body is seen on CT scan slices in a similar fashion from the skin to the central part of the body being examined. When these levels are further "added" together, a three-dimensional picture of an organ or abnormal body structure can be obtained.